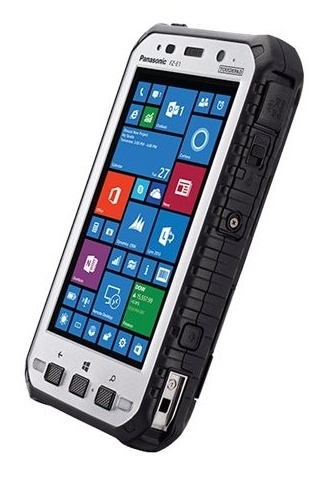 Panasonic Toughpad FZ-E1 5" Handheld tablet with Windows 10 IoT Mobile Enterprise, BCR*, data & voice - The Toughpad FZ-E1 brings together the best of handheld, smartphone and Barcode reader* functionality into a single rugged and hard working 5" tablet. It is the ideal tool for mobile workers in the transportation & logistics, postal services, MoD, emergency & public safety, utilities, retail and manufacturing sectors. Thanks to its fully-rugged design with MIL-STD-810G certification, IP68 ratings and 3 meter drop resistance, the FZ-E1 promises a long life span and very low TCO. With operating temperatures of -20°C to +60°C, glove & rain-enabled daylight-readable display and a high capacity 6200mAh battery, field workers can operate anywhere, anytime and for as long as they need. Toughpad FZ-E1 brings together the best of handheld, smartphone and Barcode reader* functionality into a single rugged and hard working 5 tablet. It is one of the first devices in the Toughpad line to offer voice connectivity and has been designed for mobile workers in the transportation & logistics, postal services, defence, emergency & public safety, utilities, retail and manufacturing sectors.